Much-branching shrub with straight spines, up to 3m high, native to West Indies, Central America, naturalized in tropics (Asia, Africa, Australia); cultivated in USA, Egypt, North Africa; stipules of some or all the leaves persistent and spinescent; leaves bipinnate, the pinnae 2-6 pairs; leaflets mostly 10-25 pairs, linear, glabrous; flowers deep yellow, very fragrant, in heads 2-3 in the older axils; pod cylindric, scarcely dehiscent, filled with a pith wich seperates the seeds from each other (grown in early times in botanical gardens of Rome, the Farnesian Garden). 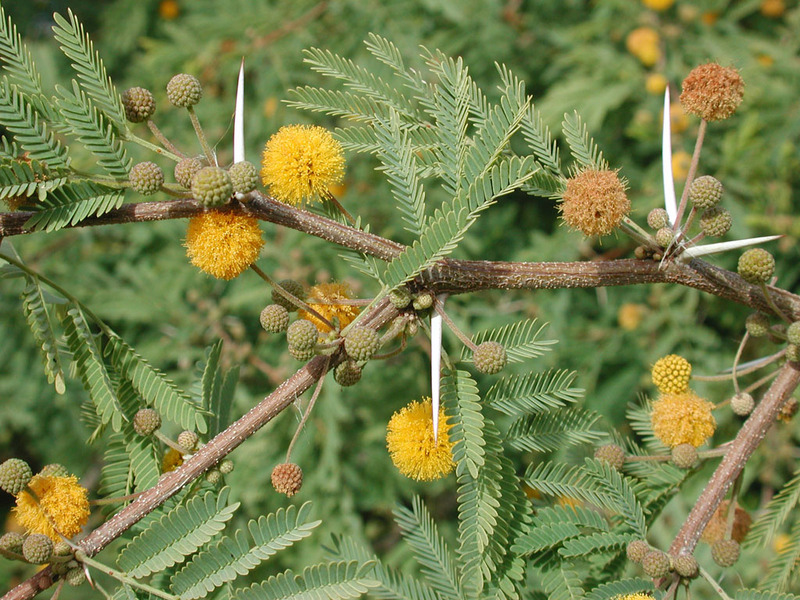 The fragrant flowers of Acacia dealbata and Vachellia farnesiana (Acacia farnesiana) are utilized in perfumery. Flowers are processed through solvent extraction to produce an absolute called Cassie. The absolute oil of cassie (Acacia farnesiana Willd.) has been fractionated by distillation and investigated by using several combined chromatographic techniques. The group with the most volatile compounds (A) contained benzoid structures like methyl salicylate, benzyl alcohol, benzaldehyde, benzyl acetate, methyl benzoate and the C6-C10 n-aldehydes. A further group (B) contained benzoid compounds like methyl 2-methoxybenzoate, methyl 2,6-dihydroxy benzoate, methyl 2-hydroxy-6-methoxy benzoate, anisaldehyde, anisyl alcohol, anisyl acetate, eugenol, veratraldehyde, and carotenoid cleavage products like alpha-ionone, beta-ionone, dihydro-beta-ionone. (Z)-3-methyl-3-decen-1-ol has been found as a new special component of the absolute. Group (C) contained a complex mixture of compounds with characteristic cassie odor. Main components were linoleic and linolenic acid with their esters. Further substances were eg. heptadecane, nonadecane, (Z)-3-methyl-3-decenoic acid, methyl vanillate, methyl anisate, methyl veratrate, dihydroactinidiolide, (E)-3-methyl-4-decenoic acid, methyl 2,6-dimethoxybenzoate, methyl 2-hydroxy-3-methoxybenzoate, methyl myristate and benzyl benzoate. The unusual C11 compounds play a prominent role in the characteristic fragrance of cassie oil. From A.farnesiana blossoms, 220ppm of volatiles could be extracted with vacuum distillation/solvent extraction. Major components of the extract were methyl salicylate (42.9%), p-anisaldehyde (15.6%), geraniol (8.8%), geranial (2.5%), geranyl acetate (3.2%), nonadecane (2.8%), benzaldehyde (3.0%), 3-methyl-3-decen-1-ol (1.7%), and methyl 2,6-dihydroxybenzoate (0.9%). Further compounds found were eg. naphtalene, myrcene, benzyl acohol, benzyl acetate, limonene, ocimene, linalool and linalool oxides, (E,Z)-2,6-nonadienal, (E)-2-nonenal, (Z)-3-nonen-1-ol, β-cyclocitral, ethyl salicylate, benzyl 2-methylpropionate, 3-methyldec-4-en-1-ol, citronellyl acetate, neryl acetate, methyl p-anisate, p-anisyl acetate, α-ionone, β-ionone, and methyl 6-methoxysalicylate. The flower absolute of A.farnesiana has been found rich in cleavage compounds of linoleic acid (adding characteristic fresh notes) like (E)-2-nonenal (0.4%), (E,Z)-2,6-nonadienol (0.5%), (Z)-3-nonen-1-ol (0.1%), (E)-2-nonen-1-ol (0.05%), (Z,Z)-3,6-nonadien-1-ol (0.3%), (E,Z)-2,6-nonadien-1-ol (0.3%). The whole plant (roots, leaves, bark, pods) contain tannins. Gum exuding from the trunk resembles gum arabic from Acacia senegal. Roots, leaves and bark are used medicinally. Pods (containing 23% tannin) and bark used to tan leather. Acacia farnesiana bark, cassie bark, is used as astringent and demulcent remedy. Acacia farnesiana flowers (Flores Aaciae, Echte Akazienblüten) are used as an antispasmodic infuse.